In a surprising announcement yesterday afternoon, English Premier League team Manchester City and Major League Baseball’s New York Yankees have established a partnership to create a new soccer team within the MLS called “New York City FCâ€. The new club will begin to play in 2015. According to Sports Business Daily, there isn’t a deal set yet for stadium construction but both Man City and the Yankees organization have plans of locating the club estate in Flushing Meadows Corona Park in Queens. 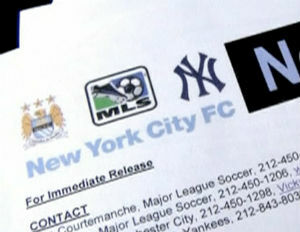 In this partnership, Manchester City would be the majority owner while the Yankees organization would be the minority owner. Man City looks forward to making use of the political connections the Yankees have and their expertise on stadium construction in New York.